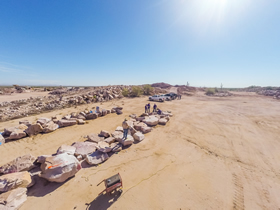 The company began production of decorative landscape boulders from its Big Horn quarry under the name of Custom Boulders in July of 1995. A crushing and screening plant was purchased the following year to also produce decorative gravels. In July 1998, the company changed its name to Custom Landscape Materials, L.L.C. to more accurately reflect the nature of its business. 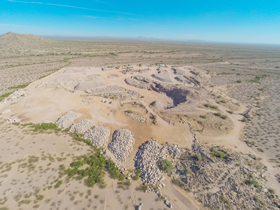 In April 2003 the Belmont Granite quarry located near the intersection of Vulture Mine Rd and the Aguila Rd, began production of “Belmont Gold” decorative rock along with State and MAG (Maricopa Association of Governments) Spec aggregates. Belmont also became the location of our first large scale Rip Rap production plant. In October of 2012 the Miller North quarry opened its doors. This location quickly became one of the west valley’s largest producers of MAG Specified ABC (aggregate base course) and Rip Rap. Custom Landscape Materials’ Big Horn property consists of 10 patented mining claims, comprising approximately 209 acres. Custom Landscape Materials has proven reserves for many decades into the future even at production rates of approximately 3000 tons per day. Custom Landscape Materials operates crushing and screening plants at all its quarry locations. The Company is capable of producing more than 5000 tons of rock per day. The company also produces many sizes of riprap (1”-5”, 3”-8”, 8”-12”, 12”-24”) plus boulders in each of the 11 colors produced. In addition pit support equipment consisting of eight 6 to 8 yard loaders, 4 smaller front end loaders, 4 excavators, 2 loader backhoes, 5 water trucks, 28 haul trucks, bulldozers, drills, and a complete shop and repair facility are used at each pit in the production process. For the benefit of our customers and developers, the company expects sufficient reserves to be available at current production rates for several more DECADES. Larger rip rap upon special order. Boulders - To any size. Custom Landscape Materials, LLC (CLM) the name begins with “Custom”. This word encapsulates our philosophy, we will customize our colors to provide a developer with a unique blend of color and / or sizing to establish a Master Plan “look”. CLM has the reserves to ensure the developer that when they start with a “look” in Phase One it will be the same “look” in ten or twenty years on the last phase. These “Custom” blends of color and sizing have already helped developers set their sub-division apart from the norm. 11435 North Cave Creek Rd. 1. To Get to The Big Horn Pit from Phoenix Take I-10 to 339th Ave. (exit 103 and Rip Griffin`s Truck Stop). Go north to Indian School Rd. (1 ½ miles) then go west to 355th Ave (1 ½ miles). Now proceed north approximately 17 miles to the "Stop"sign at the corner of Vulture Mine Rd. &355th Ave. Travel STRAIGHT through the corner onto the county gravel road (Note the Custom Landscape Materials sign). Drive 11 miles on this road to the Custom landscape Materials road that turns to the south. After traveling for six miles on the southerly road you will be at Custom Landscape Materials. 2. To Get to The Belmont "Desert Granite" pit Take I-10 to 339th Ave. (exit 103 and Rip Griffin`s Truck Stop). Go north to Indian School Rd. (1 ½ miles) then go west to 355th Ave (1 ½ miles). Now proceed north approximately 17 miles to the "Stop"sign at the corner of Vulture Mine Rd. & 355th Ave. Turn south (left) onto the pit access gravel road. Drive 1 ½ miles on this road to the Custom landscape Materials road that turns to the west (right). This is the entrance to the Pit. 25376 W. Tonopah Salome Hwy.